When you take the plots of two successful movie franchises, and blend them into one, often the results are mixed, but this time, thanks to an all-star cast, The Hangover meets Grumpy Old Men in Last Vegas, and the results are hilarious. Billy (Michael Douglas) is 70 years old and about to marry a college student. While he seems content with his new life, he desires one last vacation with his three best friends from the old neighborhood. Reluctantly putting aside old quarrels, the men meet in Las Vegas for Billy's bachelor party, and once things get going, these guys prove that they are anything but over the hill. It's hard to go wrong with a cast of Academy Award winners that have literally hundreds of films under their belts, but a film like Last Vegas really does come down to the writing. If it's not hilarious, in the eyes of the audience, the cast will seem as over the hill as their characters. Thankfully, that wasn't the case, as simply the chemistry between these guys leads to some hilarious moments, that I'd be willing to bet were completely unscripted. 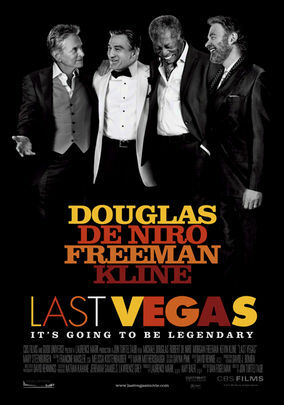 Each actor brings their own unique style and brand of humor to the part and when they finally come together in Las Vegas, this film takes off. It isn't an exaggeration to say that this is one of the funniest films I've seen all year. Just the guys reaction to the things associated with modern day Las Vegas, like the technology, thugs, rap music, and strippers is absolutely priceless. The ancient cast and a PG-13 rating turned a lot of people off to this film, but the cast is a complete throw back trapped in a modern party town, leading to some epic scenes. Last Vegas is an absolute comedy gem, that somehow fell under most peoples radars, but it is every bit as good as the Hangover was, and maybe even more so, thanks to the experience of the cast and their tremendous chemistry.